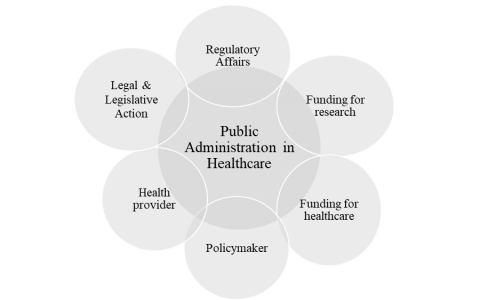 Public administration is deeply embedded in the delivery of health care in the U.S. Seriously, we spend a lot of money on health care. Our total national health expenditures have risen above three trillion dollars — about 29 percent of it from federal government sources and another 17 percent from state and local governments (Centers for Medicare and Medicaid Services). That’s a lot of public money. 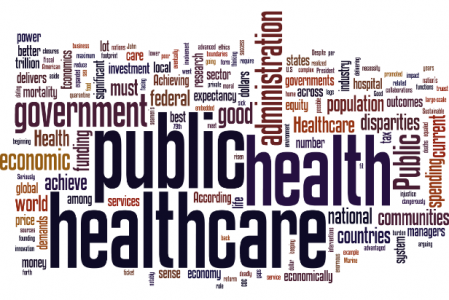 But aside from funding, how do public managers fit in the health care industrial complex? Public administration functions in different, yet connected, capacities (see figure 1). Indeed, the massive economic footprint of the health care industry is fundamentally dependent upon the public sector. So why are we arguing about public spending on health care? Our debate should be how best to leverage public dollars to achieve maximum public benefit. 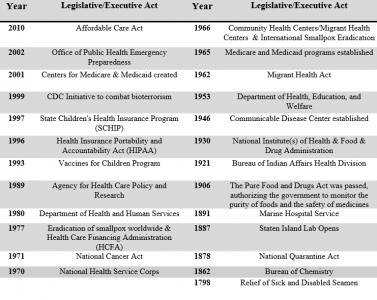 We have a long history of public sector involvement in health care dating back to nearly the beginning of our nation’s founding. According to O’Carroll, Yasnoff, Ward, Ripp, & Martin, in Public Health Informatics and Information Systems, recognizing the economic necessity of keeping a workforce healthy, President John Adams’s administration enacted a tax levy on seamen’s wages to provide hospital care for disabled and sick seamen in 1798. This was our first documented national public health care effort. 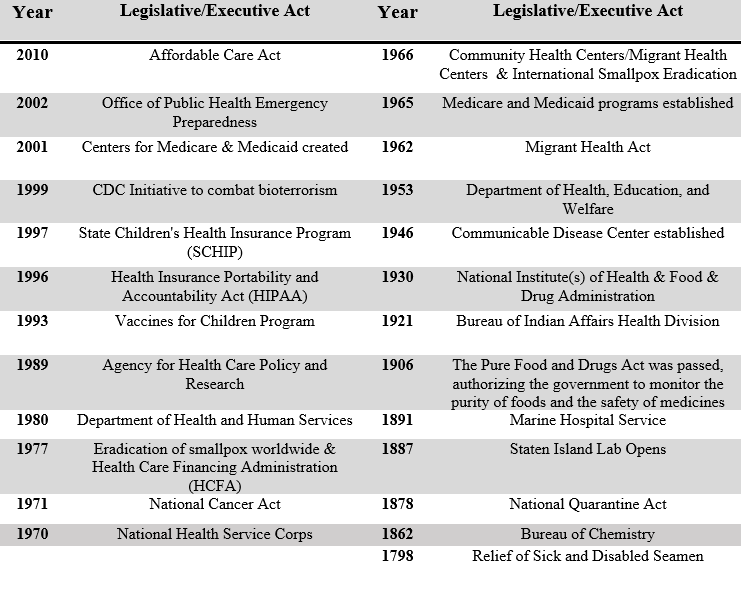 Subsequent legislation went on to establish food safety, funding for research, policies for sanitation and clean water, environmental health protections, and more (See table 1). In 1878 the federal government wrested power away from the states to consolidate quarantine power with the federal government through transfer to the Marine Hospital Service, which eventually became our current public health service. Source: Knepper, H. (2018). Healthcare in the United States: Achieving Fiscal Health in the Marketplace or Delivering a Sustainable Public Good? In Positioning Markets and Governments in Public Management (pp. 73-85). IGI Global. The role of public administration in health care is clear in our ASPA code of ethics — the ethical obligation to “strengthen social justice” as we work to “reduce unfairness, injustice, and inequality.” More than a moral good, it makes good business sense (Economics of Healthcare and The Economics of Health and Healthcare). But how do we facilitate a fair and equitable health care system that delivers the most good for the greatest number of people? In our current global environment resource allocation cannot be limited by government boundaries. This creates tensions across local communities and regions, across states and national jurisdictions. One example? The rising hospital closures crisis (Beckers Hospital Closures and Health Resources and Services Administration Hospital Closures). We have the largest economy in the world. Yet, we ranked 79th in life expectancy, 29th for infant mortality and 28th for maternal mortality, among 191 countries. You’re probably thinking that’s pretty good! But it isn’t. Despite our number one ranking in health care spending per capita and pharmaceutical spending, dozens of countries achieve better health outcomes (OECD U.S.). Why seek solutions when our economy is flying high and our health care industry is a $3 trillion dollar titan? Because our population health lags behind less economically advantaged nations and because chronic health conditions are dangerously skewed: obesity and diabetes related deaths are higher for American Blacks (38.4/100,000 respectively) than for Whites (19.4 per 100,000 respectively). According to Purnell, et al. in Achieving Health Equity: Closing The Gaps In Health Care Disparities, Interventions, And Research rural communities experience disproportionate health disparities. As public managers it is our responsibility to reduce disparities. The ticket price for population health is steep. But, this investment delivers a significant impact, contributing to large-scale employment, innovation and economic growth. To reform population health in its truest sense, and to align more closely with most economically advanced countries around the world, we must develop some form of universal health care. This demands effective collaborations among corporate boardrooms and government to generate greater health equity both at home and globally. Our current health care system has promoted global health, eradicated deadly diseases, led the world in medical technology and expanded life expectancy for over 200 years. We’re ready for the next step.